We thought we can reach tens of thousands of people on social media. We thought we can engage them emotionally, so they will donate online. And we thought a man would fish, if you give him a fishing rod. How foolish was that? Our work is only fruitful and sustainable, when a certain basis is existent. Especially when it comes to Online Fundraising, the director of the organization should be aware about the potentials and keen to get started. Every new tool we introduce needs to be fully understood by staff members as well as the benefit it brings to their organization – especially when we aim for long-term improvements. Having enough time towards the end of our cooperation to hold extensive workshops is crucially important. 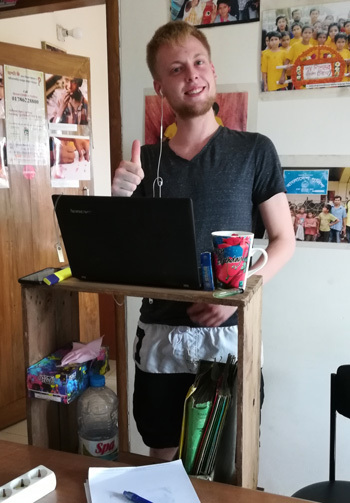 Domenic at his homemade back-friendly desk – necessity if you lack a proper chair to work. After three to four weeks, the momentum gets lost and we get sucked into the void of routine. We have met everyone, seen all the projects and worked an average of 10h a day. But to stay creative and efficient, a high level of motivation is essential. This is why we decided that four weeks are a good time to spend with an organization to keep up the drive. This certainly is overstated and especially during our work with Guria in Varanasi the opposite was true. But previously we repeatedly had the impression, that the organizations officials don’t really know what they want (except for “a website and a video”). That’s ok, we came to consult them in a field they have no expertise in. The problems arose when we started doing what we thought was the best possible solution and after we finished the task, it wasn’t meeting the imagined results. Well, this is inevitable since we can not look into brains and it will still take some time until we can send thoughts like text messages. Until then we found an interim solution that is twofold: Firstly, we started to ask the right questions beforehand and secondly, we share early drafts to make sure the website/image video/concept is going in the right direction. This goes hand in hand with learning 1. Even if we are convinced that e.g. a quarterly newsletter showcasing the key achievements of the organization would significantly increase donor retention, setting everything up without the organization asking for it is a wasted effort. My parents once told me they got three children so whenever two argue stubbornly, there is a third to negotiate a deal so that the dinner can continue without spaghettis flying through the room. I am sure, there are other benefits of having several children, but when it comes to set up a team, always go for uneven numbers. Although the three of us are friends for over a decade, our perspectives tend to differ widely (and are increasingly passionately defended when beer is around). The vibe in the team benefitted from having a third instance making a judgement call every now and then. The first and last VLOG we shot during the pilotphase of NG3O. 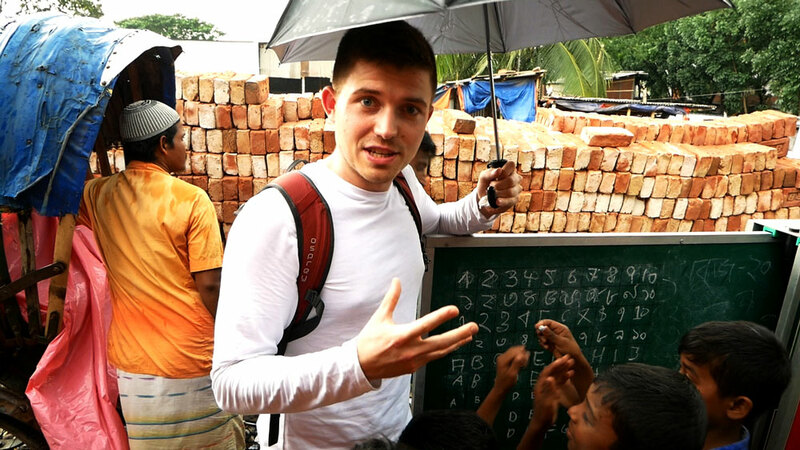 Afterwards we decided to use 100% of our time and energy to work towards the benefit of the partner NGOs. A large following on Facebook, Instagram and YouTube has certain perks: companies will approach you to advertise their products, offering free goods and/or direct payments we could use to get NG3O off the ground. Furthermore, we hoped to give organizations a kick-off boost for their social media appearance through publishing content that showcases their work. All of this is true, but we underestimated the effort it takes to build an audience. You must consistently post pictures and videos several times a day to engage people and be prioritized in the feed algorithms. We weren’t willing to do that because we had to choose wisely how we spend our time: do we produce a video for NG3O or do we produce a video for the NGO we partner with? We decided to do the latter. How will we make use of our experience and knowledge? We sat down to rethink NG3O considering all possibilities from dissolving the organization to founding a social business. We are very excited about our new plan and what the future of NG3O will look like. We soon will incorporate the changes along with launching a new communication strategy on the website and social media channels.